A leaking bathtub faucet wastes water and can stain the bathtub if there are minerals such as iron and lime in the water. Leaking faucets are commonly the result of worn rubber washers, worn packings or corroded stems. Homeowners with basic plumbing knowledge can repair leaking bathtub faucets themselves, avoiding costly plumbing contractor fees. Many plumbing supply stores carry faucet rebuild kits, which include all the necessary replacement pieces. Some older-model faucets are now obsolete and parts are unavailable for them, in which case replacement of the entire faucet may be necessary. This job takes up to two hours to complete. Use a faucet rebuild kit to stop annoying drips and leaks in the bathtub faucet. Turn off the water supply to the bathtub faucet; there may be valves located in the access area behind the bathtub faucet wall. If there are no valves, then turn off the main water supply to the house. Remove the faucet handle screws that are located beneath the hot and cold screw caps, using a screwdriver or an Allen wrench. Some faucet models have Allen screws on the underside of the handle to hold it in place. Slide the stem collar escutcheons off of the stem collars; some models have Allen or straight screws on the underside of the escutcheon holding it in place, while others simply slide off. Unscrew the stem collar or slide it off from the stem; this is the method for double-handled faucets. 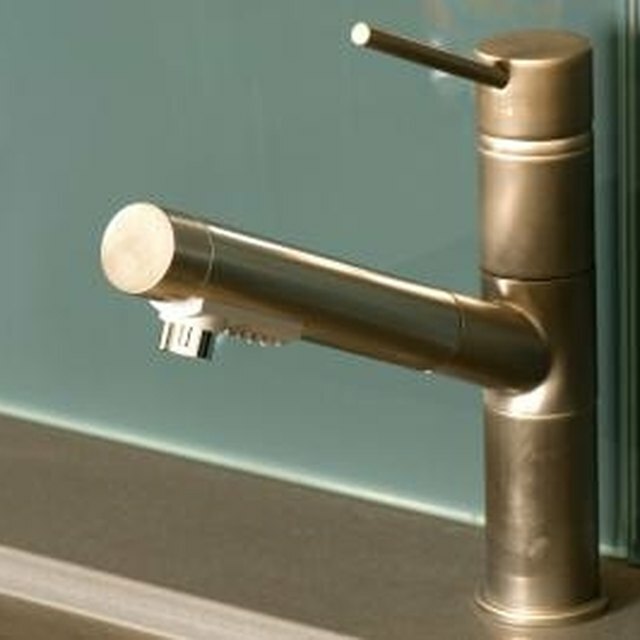 For single-handled faucets, remove the two screws holding the cover plate on and slide the cover plate off of the faucet. Unscrew the stem from the faucet with an adjustable wrench; use plumber's sockets to remove recessed stems. Pull the holding pin out with a pair of needle-nosed pliers and pull out the cartridge with slip-groove pliers. Remove the screws that hold the rubber washers to the stem and discard the old washers. Slide new rubber washers and graphite packing onto the stems. Lube the stems thoroughly with plumber's grease; this will ensure smooth stem or cartridge operation. Screw the stems into the faucet and tighten. Put the cartridge back into the faucet and replace the holding pin, a Y-shaped pin that slides into the top of the diverter to lock the cartridge in place. Screw or slide the stem collars onto the faucet. Slide the stem collar escutcheons back in place on the stem collars and tighten the set screw, if equipped. Install the handles and handle screws -- do not overtighten the handle screws because this will snap the screw heads off. Some faucet handles are equipped with standard screws while others may have Allen screws on the underside of the handle. Snap the hot and cold faucet handle screw caps into place on the handles. Caulk the bathtub faucet escutcheons with a squeeze tube of silicone caulk. While caulking the faucet escutcheons, take a little extra time to add more caulk around the bathtub to prevent water damage.